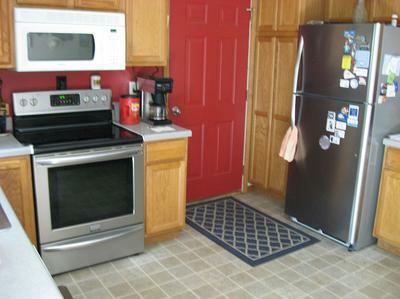 See how the stainless color of the fridge and stove are close enough to match? Upscale design that looks great with our SS dishwasher and range. We've had it for 3 months now, with no major issues to date. Smudge-proof finish delivers on the promise, but it's a bit darker than un-coated stainless. Still, not enough of a difference to clash with your other SS appliances. It's a bit deeper, taller, and narrower than some other models, so measure carefully. We found the best setting for the cold controls was MAX for the freezer and 3/4 MAX for the fridge. 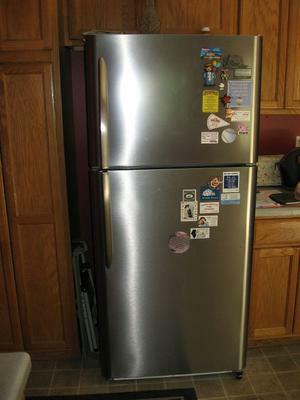 Fridge generally maintains a steady 35-40 degrees. 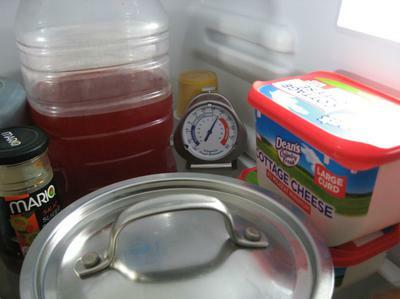 Freezer temp ranges from slightly below zero to about +15 degrees when packed. On average, it stays pretty steady at +5 degrees. Cooling performance looks decent. Interior lighting is excellent, very well thought-out. Freezer light is unbelievably convenient. Glass shelves are sturdy, and the slide-out mounting makes swapping shelves a snap. Our only gripe is the options for height placement are quite limited. There are 4 slide-in slots permanently molded into the interior walls. The top position is virtually useless, and blocks light from the side-mounted lamps. I think most folks will find a configuration that works for them, but more slots would be nice. Otherwise, a nicely designed interior. Plenty of usable space - takes a lot of food to fill it. Freezer space (without ice maker) is a bit tight, but we're managing OK. If you've got a stand-alone freezer, then no problem. Door buckets are roomy, sturdy, and the options for placement are numerous. Great feature. Would recommend you purchase a factory butter/dairy compartment. Only costs about 15-20 bucks, and is well worth it. Holds two rectangular butter dishes with room to spare. The noise level seems about average to us. I know that noise tolerance is subjective, but this doesn't seem any louder than most. We have a small house with the living room semi-open to the kitchen. You can hear a low-pitched hum in the Liv Rm, but it's not loud enough to turn up the TV or interfere with conversation. Most folks should find the noise level acceptable. The popping noise many others mention is very strange, but it goes away 15-20 seconds after the compressor first kicks in. I'm guessing this is the result of expansion in the cabinet or system, and it doesn't seem to have any affect on performance. Perhaps a side-effect of energy efficiency? I'm currently looking into ways to dampen or eliminate this noise, and will post back with the results. For the time being, it's something we can live with - but it's weird. 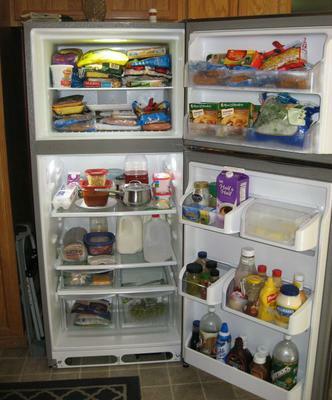 While not perfect, this Gallery fridge has met our expectations and then some. Looks great, performs well, and packs some handy features. If it lasts, I'd call this a good choice for the price. However, we hedged our bet with a 5-year extended warranty.